READY TO CRUISE? - WE ARE! So there you are, lounging by the pool on your last day at sea - tanned, rested, and ready to take on that big world after an amazing cruise! Except there’s that small matter of getting off the ship… and through the customs line… with 5,000 of your newest friends. If you’re like us, you’re probably ready to sign on as crew and never set foot on land again! 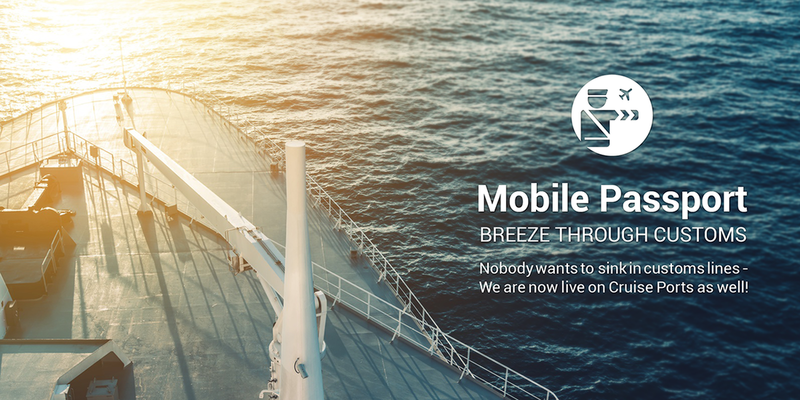 Mobile Passport is here to keep you on an even keel! After helping nearly a million air travelers fly through U.S. passport control and customs at 20 major U.S. airports, we are extending our fast and easy service to cruise ports. Download the free Mobile Passport app, follow the instructions and sail smoothly through the customs line! 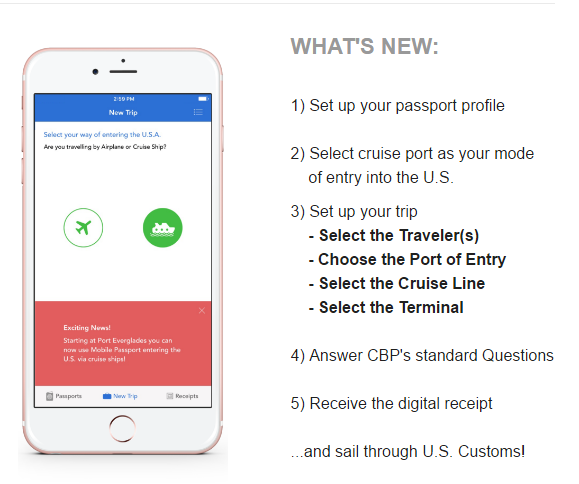 Try Mobile Passport at Port Everglades in Fort Lauderdale, Florida, starting with our iOS app! Coming soon: more cruise ports and the Android app! I read a great article today and decided to share it with you in it's entirety. Lounging on a deck chair and eating chocolate buffets by moonlight? Please—this is not your mother’s cruise industry any more. 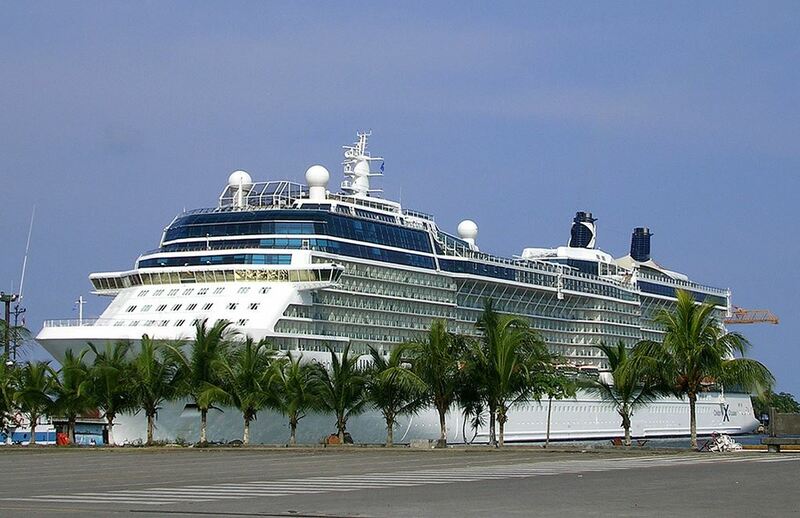 In honor of Plan A Cruise Month, the Cruise Lines International Association (CLIA) yesterday released a list of the top 10 unexpected things to do on today’s cruise ships—and they are hardly about gaining five pounds. In a world of multi-generational, experiential, active and immersive travel, the point is to do something you can write home about. And post on Facebook. So here’s CLIA’s list of the Top 10 unexpected things you can do on a cruise. 1. Visit the South Pole. Seabourn Cruises offers cruises to the southernmost point on the globe, where guests can explore and enjoy technical climbs and ski tours. On MSC Cruises’ MSC Seaside, guests can stroll three catwalks that extend beyond the edge of the ship, so you feel like you have walked on water. And you don’t have to towel off after. 3. Dive with the son of Jacques Cousteau. On Paul Gaugin Cruises guests can learn from and dive with Jean-Michel Cousteau, son of the most famous oceanographer of all time, Jacques Cousteau. 4. Visit a planetarium at sea. Cunard’s Queen Mary 2 has the only planetarium at sea, where guests can enjoy the “Cosmic Collisions" and "Stars Over the Atlantic” shows three times a day. Whether it is food or fitness, music or opera, cruise lines offer experiences that allow guests to fully immerse themselves in their passions. For example, Uniworld Boutique River Cruise Collection will sail its first Jewish Heritage themed cruises next year on all departures of its Rhine-Main Discovery and Munich itineraries. 6. Personalize your cruise experiences and itineraries. It’s no longer about the cruise line choosing experiences for guests. Guests now are in control of what they’ll see, eat and drink, both onboard and onshore. Azamara Club Cruises, for instance, offers completely customized land tours at all destinations through its Private Journeys program. 7. Attend a concert at sea. Besides the nightly shows, cruise lines are bringing on top performers in arena-style performances. Pop star Demi Lovato will headline Celebrity Cruises’ first-ever concert series with a one-night show for passengers on each of four Celebrity sailings in December; country music star Sam Hunt, comedian Jim Gaffigan, and others have been added to Carnival Cruise Line’s concert series, Carnival Live; a live production of Tangled will be the highlight on Disney Magic starting November 2017. 8. Get pampered without leaving your cabin. Spas are getting larger and more innovative, but you don’t even have to leave your cabin to get the full treatment. Regent Seven Seas Cruises, for example, offers a number of in-suite spa services. 9. Ride a bike in the sky. SkyRide, the aerial attraction offered on a number of Carnival Cruise Line ships, takes guests 150 feet above sea level for a real bird’s-eye view of the sea. Or guests can jump on recumbent-style bikes and travel up to 18 miles an hour on an 800-foot-long track. 10. Challenge your mind and body. Cruise lines offer more opportunities to engage yourself physically and mentally during your time onboard. Costa Cruises, for instance, lets guests on Costa Diademia practice their spy skills in the Start Laser area, a laser maze that tests your super-spy abilities, while Viking Ocean cruises offers experts to speak about the history and highlights of the regions through which you pass. ​Your passport is an important document and should always be kept safe. But if your passport is lost or stolen abroad, you can get help! Recently one of my clients had their passports stolen while on vacation. This was the first time I had ever encountered this problem. Fortunately, my client had already taken action before I was notified of the problem. They did all the right things and were able to make their flight later that afternoon. 1. Don't Panic - While this isn't the best news in the world, it is also not the worst and you can get this taken care of. It will be a bit of a hassle but you will be able to get back to the USA. 2. File a Police Report Immediately. A police report will validate your information should someone try to use your passport illegally. Make sure before you leave the police station that you have a copy of the report for your records. It is also is especially important if you plan on claiming the cost of replacement on your travel insurance. 3. Locate Nearest U.S. Embassy or Consulate. Once you’ve located the US Embassy in the country you’re visiting (for a complete list, click here), you will need to schedule an emergency appointment. Generally, appointments are available Monday-Friday mornings (excluding Federal Holidays) and there are no walk-ins allowed. They will do their best to help you as quickly as possible but it can take some time. Your location and circumstances may limit the help they can give you. Proof of U.S. citizenship (copy of passport) and a form of primary identification (drivers license or military ID). If you cannot present primary evidence of U.S. citizenship, you must submit secondary evidence of U.S. citizenship. 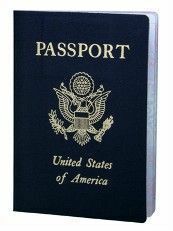 ***If you have an extra copy of your passport with you, it could help streamline/expedite the process of proving your identity to a representative. Passport photo—if you do not already have an extra photo handy, there are often stores and businesses located near the U.S. Consulate or Embassy where you can get passport photos. Either way, make sure your passport photo meets the State Department’s specific passport photo requirements. Payment—while the specific fees for services are the same as if you were in the U.S, embassies and consulates overseas can only accept your payment in cash in U.S. or local currency on site (or in some cases via credit card). And unlike acceptance facilities located in the U.S., they don’t accept personal checks. Check the website of your embassy or consulate to see what forms of payment they are able to accept. If your wallet was lost or stolen (or if you were a victim of a natural disaster) and you cannot reasonably obtain money to pay the fees before continuing travel, no passport fee will be charged. You should receive your new temporary US passport within 24 hours. This passport is only good for one year and will need to immediately be renewed and replaced with a traditional 10-year passport once you have returned back to the United States. If you are notified by a relative or friend traveling abroad that his/her U.S. passport has been lost/stolen, you may wish to contact the Office of Overseas Citizens Services, U.S. Department of State in Washington, D.C, at 1-888-407-4747. That office will be able to help you put your friend or loved one in touch with the closest U.S. embassy or consulate. Your relative/friend must apply in person for a new passport at the U.S. embassy or consulate. WHAT CAN YOU DO IN ADVANCE TO PREVENT LOSS? Always keep your passport in a safe (at home OR on vacation) when not in use. Never leave your passport unattended anywhere for any length of time. If the passport is not in the safe, you should be carrying it on your person it in a secure manner. Be sure to keep your passport clean and do not allow it to get damp or wet as that may render it unusable. I personally had to visit the Embassy in the Bahamas one time because my passport got wet. They issued me an emergency document which allowed me to get home but I had to replace my passport immediately. Keep electronic and paper copies of your passport, and other necessary documents, safe but accessible to you while away (e.g. with a family member at home). A useful idea is to email yourself a scan or picture of your passport and important documents, so that you can access them wherever you are. You can also take a photo of the page where your picture and info is with a smart phone and keep it in your phone. This is helpful if you need to retrieve it and you don't have internet service. KEEP YOUR PASSPORT SAFE AT ALL TIMES! A﻿RE YOU A SMART TRAVELER? Insurance of all kinds (auto, home, health, life, etc ) always seems like a waste of money .... until something happpens. Travel insurance is no different. With all that can go wrong on a trip — you wake up too ill to fly or lose your passport while on an excursion — travel insurance can come in handy. If someone in your party becomes injured, critically ill or dies while traveling you would deeply regret not having that safety net. 1. Life is unpredictable. Some trips need to be cancelled. With travel insurance, travelers don't have to pay for a trip they are unable to take if they are cancelling for a covered reason. 2. Most lost luggage takes five days to return to its owner. You are going to have to shell out money for clothes and personal items. With insurance you will be reimbursed for the amount covered in the policy. 3. Lost or forgotten medication? Travel insurance will assist you in locating a pharmacy to purchase a new prescription. 4. 30%-50% of travelers stateside and abroad will become ill or injured during their trip. That's almost one out of every two travelers. Travel insurance can provide peace of mind - especially for travel outside the United States, where many hospitals request cash payments in the thousands before treatment can even begin. 5. Health insurance may not go the distance. The majority of health insurance (including Medicare), worker's compensation insurance, third-party and personal liability policies don't cover international travel. In fact, a closer look at the inside of your passport will reveal that the government recommends travel insurance when traveling outside the United States. 7. Credit card coverage, homeowners and auto insurance ? none of these provide sufficient coverage for travel. Even combined, they may not offset the cost of a medical emergency overseas. 8. Excursion tour operators often require that you purchase travel insurance. Purchasing Travel Insurance in advance helps travelers get the best coverage at the best cost. 9. Even the most stable of travel suppliers can default quickly. If a cruise line, airline or tour operator ceases operations due to financial hardship or bankruptcy, travel insurance saves travelers from paying for a trip they'll really never get to take. 10. We all experience tough economic times. The loss of a job or other income might mean a trip planned in advance may have to wait. Travel insurance puts cash back into the hands of travelers when they need it most.